"Sorry, I take pictures of poop," Shanna Schlitz ruefully shrugged as she crouched over an unidentified specimen with her iPhone. "It's not coyote; it's not our dog; it might be cougar." Photo snapped for future research, we side-stepped the mysterious droppings and continued with my tour of Blue Bee Farm, the "u-pick" blueberry farm Shanna and her family own and operate on Sauvie Island. While Shanna used to work as a photographer, her previous subject matter differed greatly from its current focus. Extensively tattooed and openly opinionated, she worked as a production manager at the Portland Mercury in her 20s. Off-hours, she enjoyed Portland's urban lifestyle: good bars, live music, a plethora of restaurants, and access to any necessity. Then, seven years ago, she married and moved to Sauvie Island, a 26,000 acre agricultural island 10 miles outside of Portland's downtown. Though her address is still technically "Portland", she might as well have moved to rural Vermont. She exchanged live music for stunning silences (or sometimes the opposite of that; she recounted the neighboring conventional nursery's middle of the night farming exploits, complete with spotlights shone in their back windows at 2 am), innovative restaurants for an immediate need to learn how to cook, and access to culture for peaceful wooded strolls down to the Multnomah Channel. Shanna and her husband Jon moved to Sauvie Island when Shanna's mother and step father purchased the two-home property after moving to Oregon from the Caribbean. Shanna knew that she and Jon wanted to have children, and the idea of living close to family and sharing a plot of agriculture land was appealing to all sides. So the couple moved to the island, ready for an unpredictable adventure. Thrust into this remote agricultural life, and already pregnant with their first child Nova, Shanna found herself in a world she hadn't imagined. "Until I was 30, I lived in town and had a super fun, hipster, swinging lifestyle," Shanna recalls. "At 30, I got married, got pregnant, moved onto a farm and changed the way my life proceeded. I went from working a job with a bunch of people to living in a place with a brand new baby and not know what I was doing about anything: babying, gardening, everything. The first couple of years were isolating." As she described the transition to me, I couldn't help but apply epic comparisons in my head, picturing Shanna as a city dweller in the 1800s suddenly navigating the Oregon Trail, or Laura Ingalls' family exchanging a log cabin for a subterranean home in "On the Banks of Plum Creek". 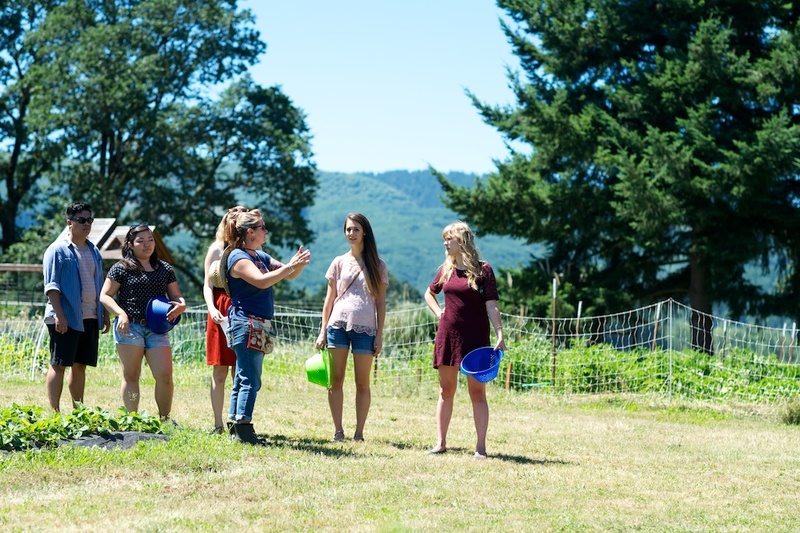 While it may not seem remote to those who frequent Sauvie Island to bike or pick pumpkins, Shanna has found living on the island an entirely different experience from visiting the island. 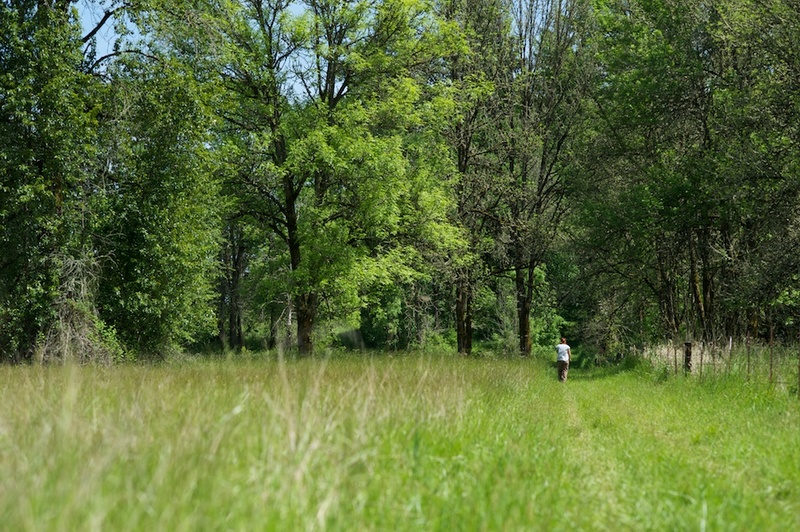 She'd assumed that people who lived on Sauvie Island would form a tight-knit, supportive community, but has found that many people move to Sauvie Island for peace and even isolation. Faced with a new life of sparse friendly faces, a new baby, and a question mark where her established career used to be, Shanna began to learn how to fend for herself. I can attest that over the past seven years, she's transformed from a self-described "assembler of meals" to an excellent cook and baker. When I first visited, she acted a bit panicky about serving me food: she'd made scones for breakfast and a quiche for lunch and was nervous that I wouldn't find it acceptable (perhaps mistaking me for a food critic, rather than a food enthusiast!). The scone I nibbled on throughout the morning was moist and crumbly, packed with flavor. And the duck egg frittata paired with a side salad and homemade dressing was sublime. Shanna, Jon, and their two children, Nova and Zephyr, share the land and blueberry farm with Shanna's mother and step father. 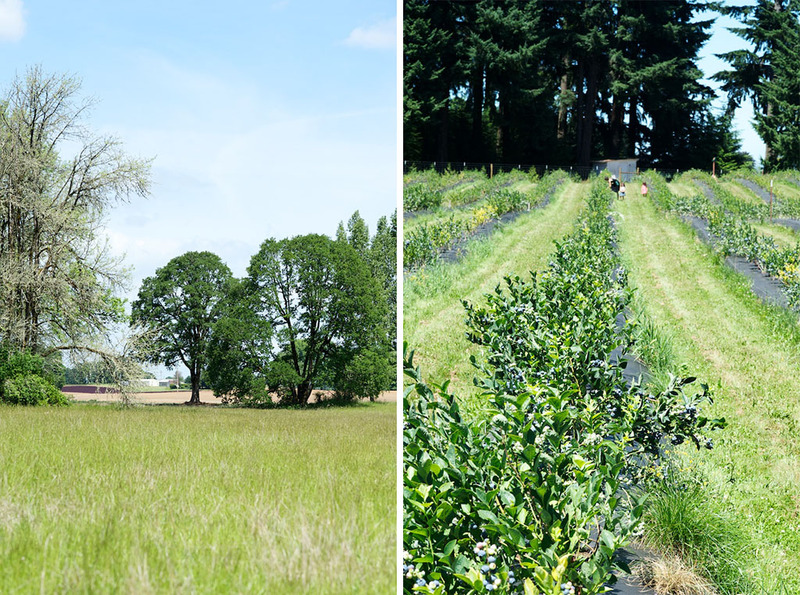 The two homes are on opposite sides of the main blueberry field: their chickens and the lower blueberry field are to the side of Shanna's house, and then if you walk through that field and take a sharp right, you can head straight down to the Willamette. It's a stunning piece of land, and it's not hard to imagine why Shanna's family leapt at the opportunity to buy it. 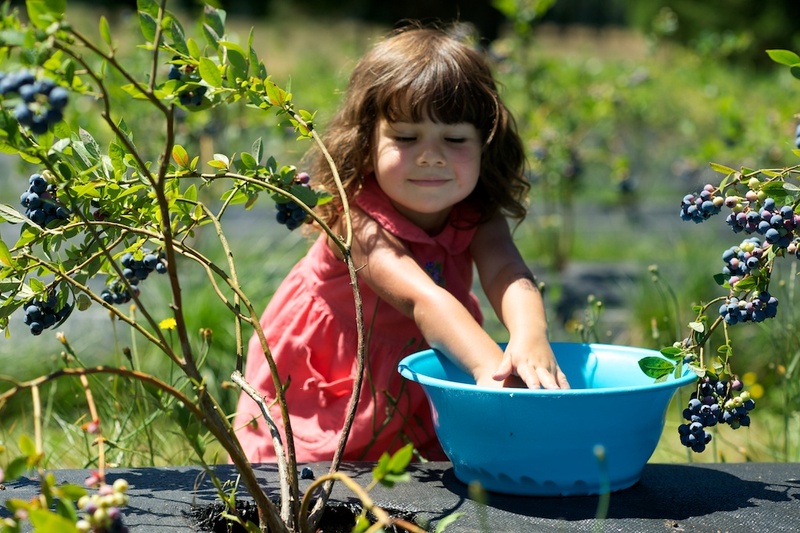 Blue Bee Farm is currently in the middle of their first full u-pick blueberry season. The blueberry plants are now three years old and ladened with fruit. After acquiring the plants from Fall Creek Nursery, Shanna planted six main varieties of berries, including reka, hardyblue, bluegold, legacy, and early blue. Though not officially certified, the farm is entirely organic; along with organic dairy compost, the predominant amendment added to the soil is fish emulsion. After we spent an hour chatting about her background and transition to the island, Shanna's voice grew more animated when we started touring the farm. She's arranged the plants according to when they'll fruit, remarking that she knows it's annoying to go to a u-pick farm and wander around trying to figure out what's ripe. She likes visitors to easily access what's available to pick and to sample as many berries as they can eat, comparing the different varieties. "One of my favorite things about the summer, as the seasonality overlaps, is to walk from one to another and compare taste different varieties," Shanna shared. "They're like grapes, it's astonishing!" Shanna proudly refers to herself as a blueberry wonk and can easily talk off the cuff about the differences among varieties. When I first visited in mid-May, the Reka and Bluegold varieties were staring to show the first blush of color. Along with the varieties planted for u-pick, Shanna's reserved 4 aisles of the Bluetta variety for herself. These plants are rather ugly and misshapen, and the fruit is so delicate, it can barely make it to my mouth before turning to juice. But the taste is like a just-baked blueberry pie; the kind of taste flavor scientists are constantly attempting to recreate. 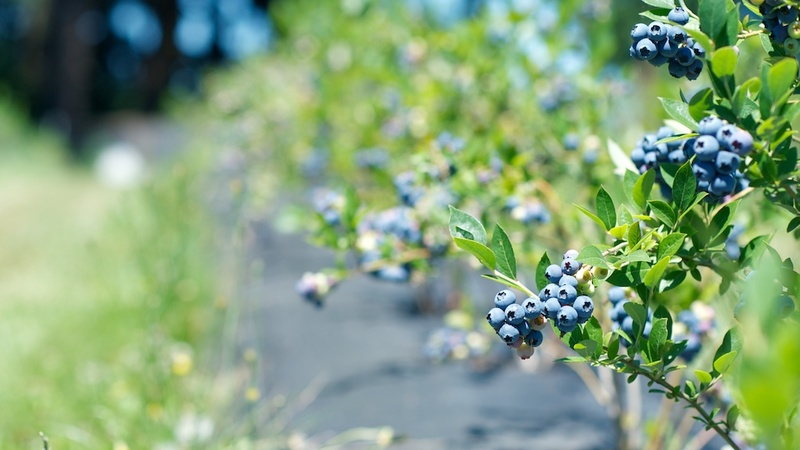 The idea of running a blueberry farm evolved over several years. After dabbling in cut flowers, including dahlias and sunflowers, the longer Shanna lived on the property, the more focused on utility she became. The word 'utility' came up frequently in conversations: she doesn't want anything on the farm that doesn't serve a purpose, from animals to what's grown on the land. Flowers, while pretty, proved to be too much work for too little income. "I don't want anything out here that's not producing something I can't use," Shanna explained. But more than just switching from flowers to blueberries for a utilitarian reason, Shanna felt a heavy emotional weight to share the land with others and to grow something with high standards. "Here I am with all this amazing space and there are people out there with idealistic excitement and no space, " she says. "It's our responsibility to make this place amazing because it has such potential." 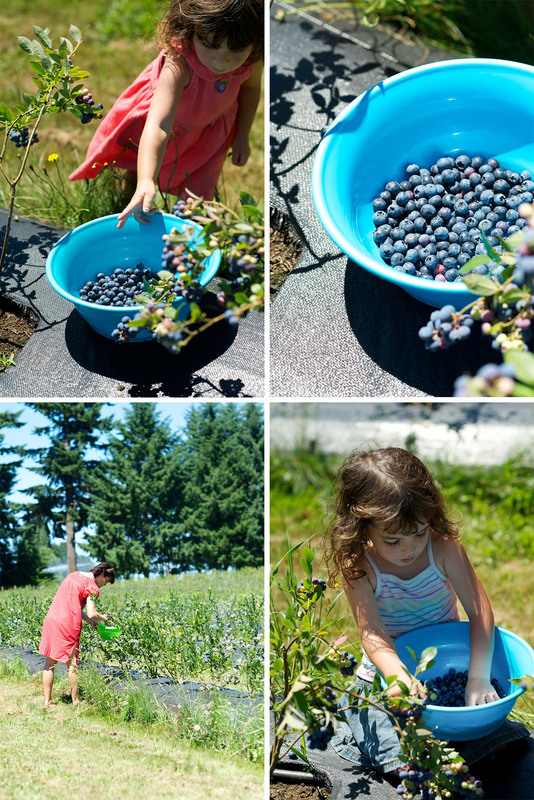 These factors – stewardship of the land, income, and community – pointed Shanna in the direction of a u-pick organic blueberry farm. 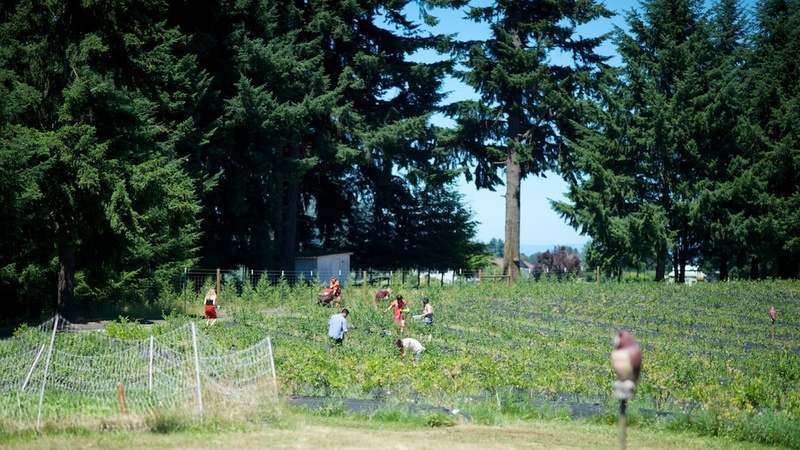 U-pick is a summer tradition, and often many people's only experience in an agricultural setting. 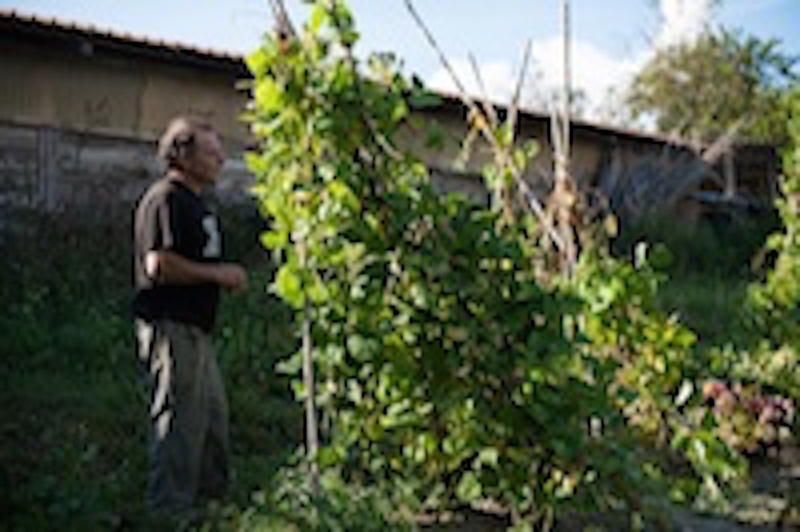 While picking berries in the blazing sun can quickly call to mind work rather than pleasure, people pick their own as a way to have a connection to their food instead of just grabbing fruit off the shelf. And if you're looking for bulk, it's definitely the frugal choice. Hobby Farms believes that the United States is a perfect environment for u-pick operations because it has less agricultural heritage than other countries. "In an odd way, this makes Americans more agriculturally nostalgic than any other [country], and therefore more enthusiastic about U-pick operations," it writes. Often, u-picks farms stand in direct contrast to their neighboring large conventional farms. This is very apparent on one popular Oregon u-pick stretch off of Scholls Ferry Road: as you drive down the road, dodging bikers and reveling winery-goers, you pass farms crowded with families picking berries directly next to farms full of immigrant laborers. Shanna wanted to create an environment that would allow her children immediate access to a variety of flavors and tastes, as well as a place that could be used as a gathering spot for other families. Shanna and Jon's children are both precociously hard workers. Zephyr, trudges around the farm in his tiny Bogs boots, preferring to be with his grandfather all day, "one of the guys", as Shanna says. And Nova takes her blueberry duties very seriously, from assembling boxes to manning the weighing station. Shanna also saw a market opening that she felt she could fill. 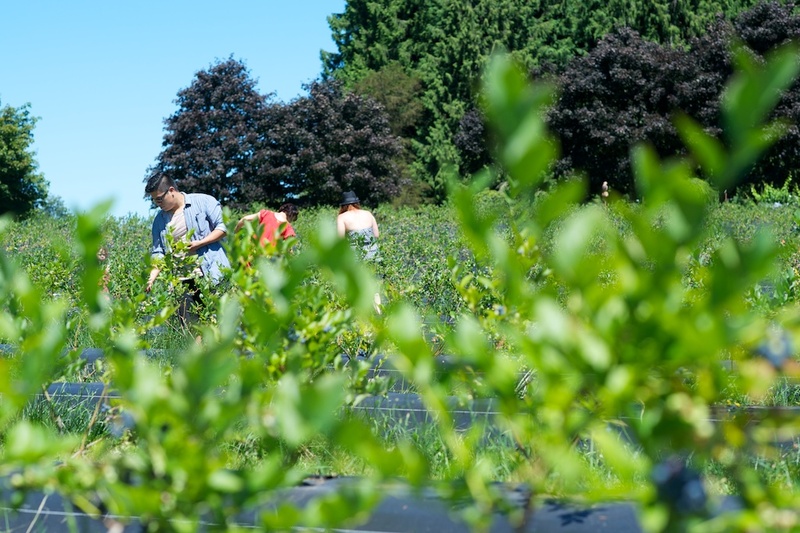 With the wealth of u-pick options in the Portland area, how can you differentiate yourself? Blue Bee Farm sets themselves apart through their multiple varieties of berries, their organic practices and complete transparency, and the quieter, less zoo-like atmosphere Shanna cultivates. 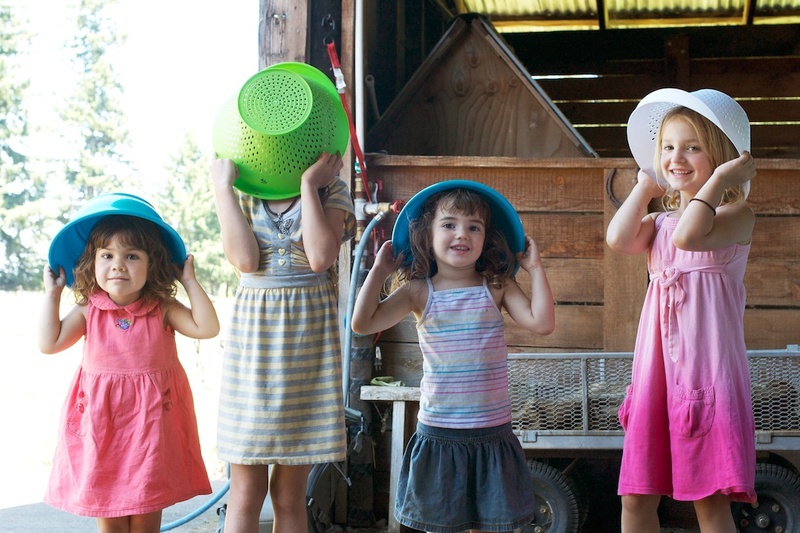 Blue Bee offers colorful buckets, sun hats, snacks, shade umbrellas, and peace. Often, on a crowded weekend in the summer, peace is the last thing you might find on a u-pick farm. 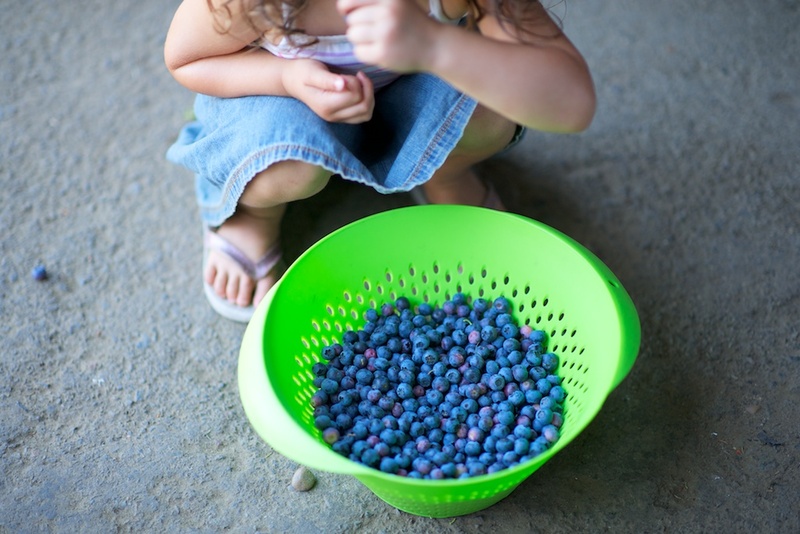 When I returned with my husband and some friends to pick blueberries last Saturday, netting 13 pounds of berries, we all felt free to roam the property, idly picking berries as we chatted. One family was even having a picnic in the middle of the blueberry rows, perched on the ground with snacks strewn about them. They looked relaxed enough to stay all afternoon if they could. In both of my visits during u-pick season, I witnessed people shocked by the quality of berries, and the accompanying price. "That's it? 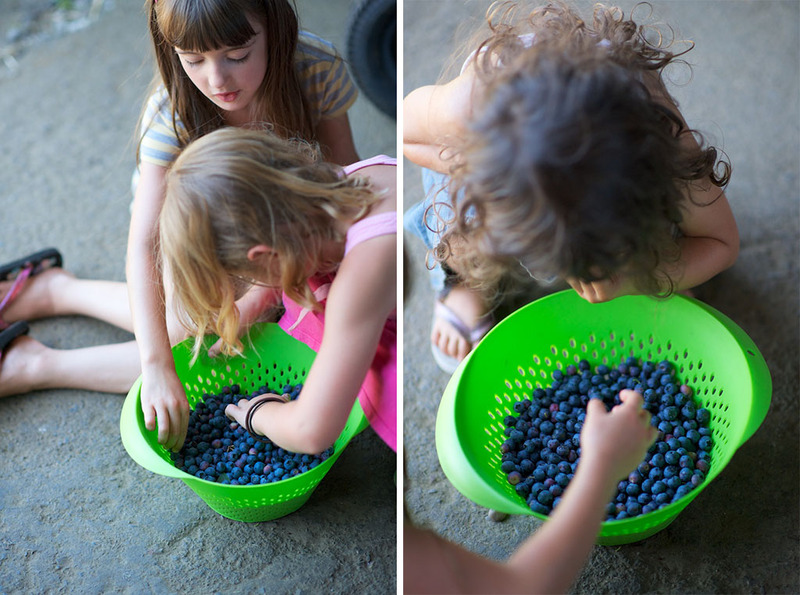 ", one girl asked after her berries were weighed and tallied, before heading back into the field with a fresh bucket to pick more. 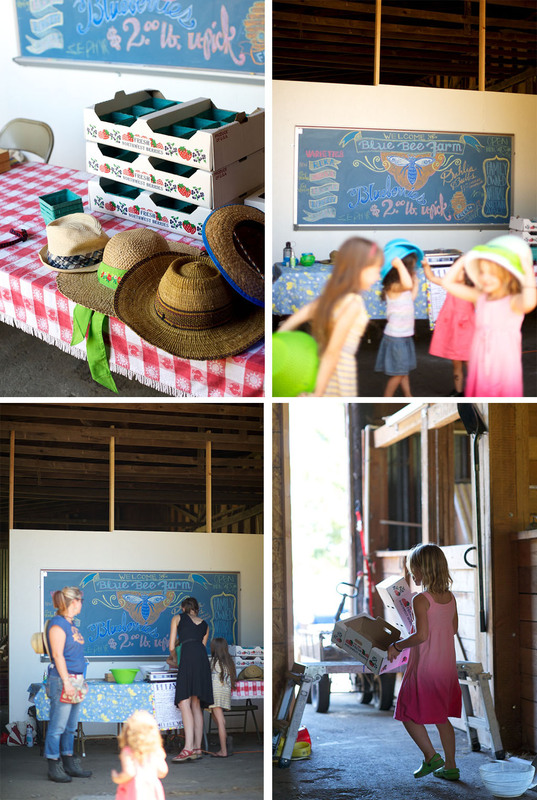 With Blue Bee's hand-painted and chalkboard signs, Shanna has found a way to put her graphic design background to use. And while she may have never imagined this life for herself, I can't easily picture Shanna returning to an urban environment. 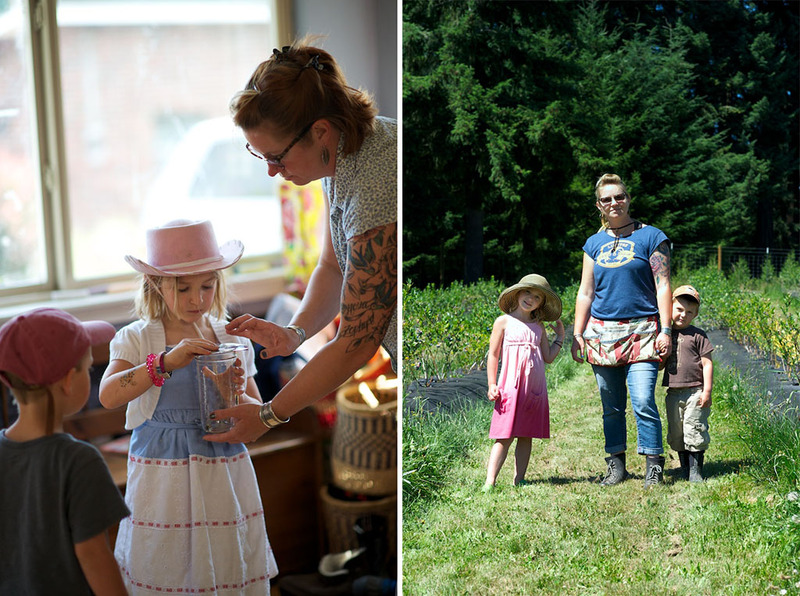 Her family is exceedingly comfortable in their large plot of land, with her kids able to play or help, and with Shanna's renewed motivation to cultivate a community that she wished had existed when she first moved to Sauvie Island. In their first full picking season, the long days have coincided with inconsistent visitors. Some days, they've sold 80 lbs of berries, on others, 300 lbs. Shanna had a vision of developing buzz around the farm via word of mouth, but acknowledges that word of mouth isn't fast enough when the berries are ready to be picked. Despite this "slow buzz" approach, each day seems to build on the previous day, with u-pickers returning for a second or third visit, friends and family in tow. 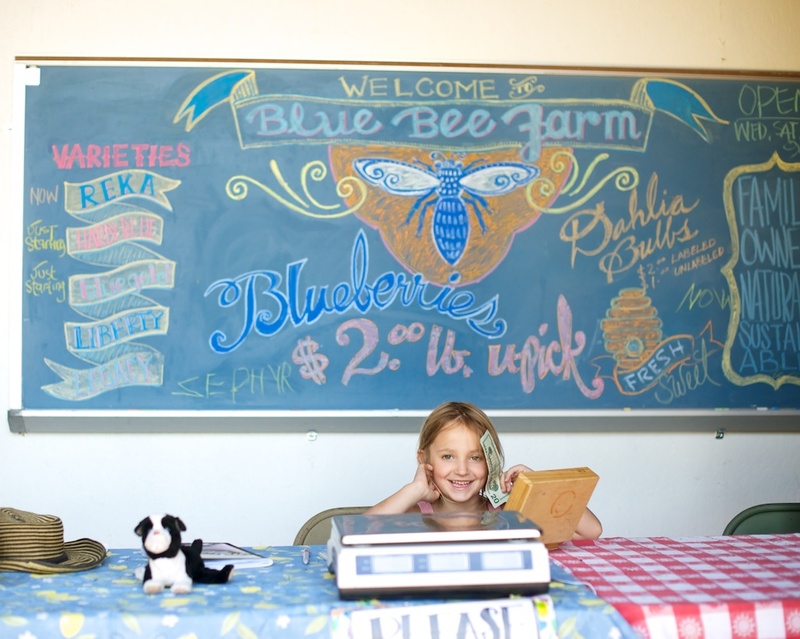 And word of mouth, while slow, will draw the kind of customers Shanna wants to have at Blue Bee: those seeking organic blueberries in a low-key atmosphere, those who want to stay and chat, and those who want to experiment with different varieties of berries. As for Shanna, her mind spins in multiple directions with future plans, sharing "I want to try it all out; I want to do all of it!". She hopes to start a canners' CSA this fall, and has visions of building a large outdoor kitchen to teach canning and slaughtering classes. She also mentioned adding cattle to the lower field and putting in more varieties of blueberry plants. But now, the focus is on this u-pick season and building repeat business. 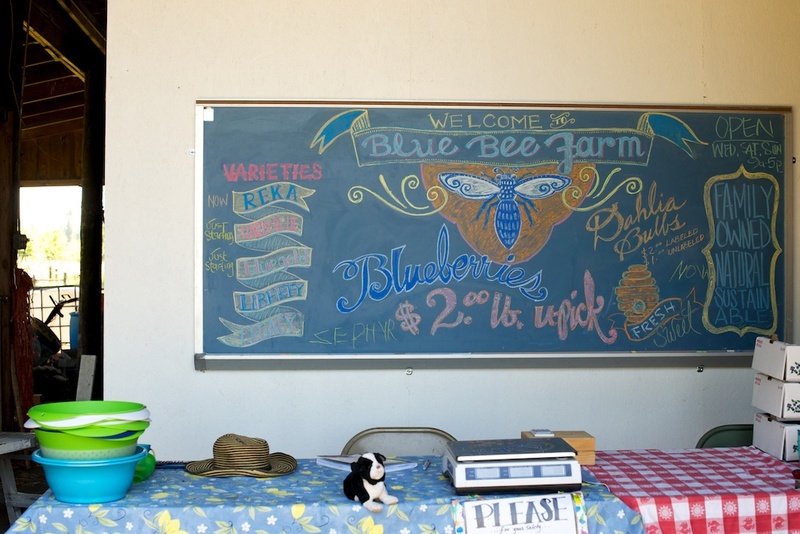 Blue Bee will be open for four to six more weeks. After freezing four pounds and turning 5 other pounds into jam, I'm almost done snacking on the remaining Blue Bee berries. A return trip is clearly in order. Open Wednesday, Saturday, and Sunday from 9 am to 8 pm, with additional days frequently added. Check their Facebook page for updates. Talking about food is best on a full stomach, as the resulting discourse, often fraught and conflicted, flows best when not hindered by hunger-induced crankiness. My husband recently rushed home from picking up a box of pasta at our local grocery store, eager to relay a conversation he’d overheard before forgetting its details.